This ADC Tibbit is based on the LTC2309 12-bit ADC with I2C interface. Only four channels of this ADC are used by the Tibbit. The analog front end of the module allows you to measure signals in the -10V to +10V range. All measurements are with respect to the system ground. 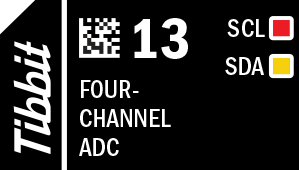 •Discard the first ADC result after the channel change. Only the second measurement will bring you the conversion data for the newly selected channel. •Do the conversion twice and discard the first result when performing sporadic measurements. This way you will obtain the "current" data. The LTC2309 ADC IC has a 12-bit resolution. The Tibbit #13 has the effective resolution of around 9~10 bits. This reduction is caused by the system noise and other factors that affect the measurement quality. Combine this Tibbit with #20 (nine terminal blocks) or #19 (DB9M connector). It's not common but possible to use the latter for wiring into the ADC inputs. The Tibbit #21 (four terminal blocks) can also be used but you will have to steal the ground elsewhere, as #21 doesn't have its own ground line and the ADC measures input voltages with respect to the system ground. There is one red and one yellow LED. The red LED is connected to the SCL line of the I2C interface, the yellow LED -- to the SDA line. The use of this Tibbit is illustrated by a Tibbo BASIC test project. Yo can find it here: https://github.com/tibbotech/CA-Test-Tibbits-13-14.